The Change Model is a framework for any project or programme that is seeking to achieve transformational, sustainable change. The model, originally developed in 2012, provides a useful organising framework for sustainable change and transformation that delivers real benefits for patients and the public. It was created to support health and care to adopt a shared approach to leading change and transformation. The model has eight components, all of which should be considered when implementing change. The components act as a guide to ensure all elements of change are considered and implemented effectively, creating an environment where change programmes deliver transformational, sustainable change. 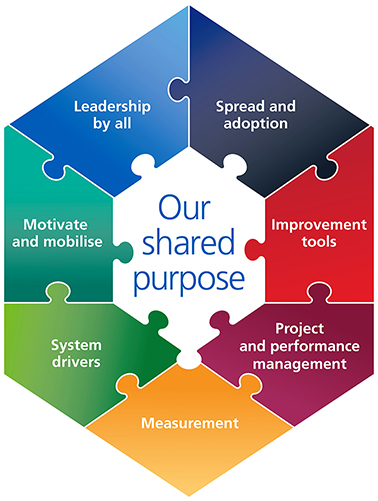 The Change Model was developed with hundreds of senior leaders, clinicians, commissioners, providers and improvement activists who want to get involved in building energy for change across health and care by adopting a systematic and sustainable approach to improving quality of care.